Brewed a three-gallon batch of saison a couple weeks ago and I racked it to the secondary today with some additional Spalter dry hops. It's a simple beer: I infusion mashed three pounds of Pilsner malt along with seven ounces of flaked wheat, added two pounds of Briess Pilsen dry malt extract and a half ounce of Spalter hops at the start the boil, another half-ounce at 15 minutes left in the boil and an ounce for the last two minutes. I neglected to add some Irish Moss for his batch, which could explain why it's cloudy. I'm guessing I'm going to end up filling 10 to 12 22-ounce bottles with this batch. That's not a lot of beer, but I like the trade off of better hop utilization and more control over color that is achieved with full wort boil. However, if I keep my batches to three to four gallons, I'm going to have brew more often. I intend on saving some time by brewing an extract batch here and there, which is what I plan on doing later this week. I picked up a four-pound can of Alexander's Wheat Malt (liquid) today and plan on making 3 to 3.5 gallon batch with that extract and some Amarillo hops, keeping a lot of the hops late in the boil for a big hop aroma and spicy character, keeping the IBUs around 30 and original gravity around 1.042. I'm hoping that I can the beer in a Party Pig and probably a few bottles in 10-14 days. Tasting all things red that I've homebrewed, which is a red ale that is aging quite nicely in Party Pig and has probably at its peak. This red ale is rather hoppy up front, no doubt due to the addition of about a half ounce dry hops in the Party Pig. The beer is quite delicious and I had to keep myself from consuming more than a few pints. I'm rather pleased with this beer, especially with the performance of the Fermentis S-04 dry yeast. The beer is fairly clean, with just enough residual sweetness to play well with the hops. The S-04 clears very well, too. I definitely think the Fermentis yeasts are big improvement over the dry yeasts from 10 or 15 years ago. Pictured to the right is Montmorency Ale. It's not quite red; maybe more pink. It was a five gallon batch brewed with one gallon of Montmorency tart cherry juice. No sweet cherries here; just tart ones and it shows - this beer has a tart character that I think is just about right. The nose is tart cherry, but there's also some lactic notes and phenolics from the yeast (although I think the lactic character could be from the cherries); almost a smokiness. The mouthfeel is fairly creamy once the carbonation settles, but the carbonation takes awhile to settle. The head is very impressive, too, with spun sugar bits sticking to the sides of the glass. I'm not sure how I achieved this, perhaps it just the yeast - Wyeast 3822 Ingelmunster Ale. 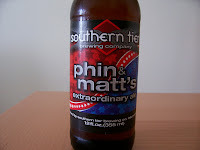 Extraordinary Ale from Souther Tier along with the brewery's India Pale Ale (IPA). First up for sampling was the crystal clear, golden Extraordinary Ale, sporting a loose meringue-like head and tingly carbonation, along with a spicy, cedar hop nose. This is followed by a crisp toasted malt flavor, which leads to a lightly bitter dry and peppery finish. The Extraordinary is a very delicious golden ale or American pale ale that is easy to drink, yet quite tasty with a very pleasant hop character. The Southern Tier IPA, on the other hand, is a touch deeper in color (light amber) than the Extraordinary Ale and kind of it's big brother. It is still quite drinkable, but slightly less sessionable due to its increase in alcohol content. There's less of a head, but what there is creates some good lacing. The nose is complex and spicy; more complex than the Extraordinary, but I can't pin down any particular flavor. It's a touch sweet and honey-like up front with moderate hoppiness towards the middle along with sweet caramel malt. The finsh is fairly assertive making a for a fairly hearty ale. This beer is good, but it strikes me as not being brewery fresh. Fortunately, it reminds me of Goose Island IPA which I can find fresher in my area. This is a beer that I could definitely enjoy out at a pub, but my fridge will probably stay stocked with GI IPA. Over at Beer Advocate, the Southern Tier is rated higher than the Goose Island, so perhaps a side by side tasting is in order, or perhaps my Southern Tier had a bit of age. I would like to compare them head to head. After killing off the rest of the red ale, I decided to try it again, mixing up some of the ingredients. I brewed another batch a couple weeks ago, but this time I left out the eight ounces of biscuit malt, I used only Amarillo hops (instead of Amarillo and Simcoe) and I replaced the Wyeast Northwest Ale with Safale S-04. It seemed like the Wyeast didn't attenuate very well, so I thought I'd try the dry yeast, because I already had it in the fridge and thought it would make a drier beer. It turned out that I was right. 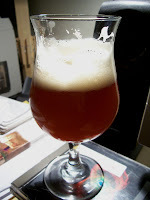 I packaged the new red ale Sunday night and upon tasting it was definitely drier and even a touch more complex. This new batch is coming across a bit hoppier up front, too, which makes sense because I used more late addition hops. For this batch I steeped a half-pound each of Crystal 150L and 80L malts. 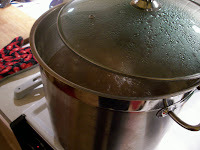 I used three pounds of Munton's Light DME and 2.5 pounds of Briess Pilsner DME for the base and four ounces of Amarillo hop pellets, adding one ounce at the start of the 60 minute boil, another ounce at 30 minutes into the boil, another after 45 minutes and another ounce at then end of the boil. I chilled the wort in my sink with my immersion chiller and pitched rehydrated DCL S-04 yeast. At packaging time I split the batch between 22-ounce bottles and a Party Pig, with the pig getting an addition of an ounce of Amarillo pellets instead of the Warrior hop plug (which ended up getting pinned between the Party Pig pouch and the wall of the pig in the last batch and seemed to add virtually no hop aroma). I look forward to the day that it'll be warm enough to do some fishing without poking a hole through a thick layer of ice. Not that I've done any ice fishing since I was a little kid. What I'm looking forward to is warmer weather. So, with the thought of warmer days, I've popped open an Arcadia Angler's Ale from Arcadia Brewing Company of Battle Creek, Michigan. According to the brewery's website, the Arcadia Brewing Company was established in 1996 as a microbrewery specializing in hand-crafted British-style ales. All of the beers are produced in small 25-barrel batches. The brewery makes notes of their "Peter Austin" brewing system, which appears to have just as much to do with the process as the equipment. This excellent article by Matt Dunn gives a pretty good description of the brewery and the process, including pictures. Arcadia is definitely interested in applying British methods of producing beer tailored to American tastes. So out of this brewery comes Angler's ale, which greets me with rather loud and long "phffft" when the cap is popped. What comes out of the bottle is a hazy golden to light amber ale with two-thirds of my glass filling up with foam. As the foam settles down I top off the pour in stops and starts, then let the beer sit. After at least 10 minutes, the foam has left a rocky head and I go in for a sniff, which is very fruity and perhaps a touch floral. Could it be that Ringwood yeast that Matt Dunn makes mention of in the previously cited article? This same fruity character is found on the palate, too. I'm thinking of a bit of apricot, but more of orange and a maybe just a touch of green apple. The hops may be contributing some of these flavors, too. Judging from the haziness, the Angler's Ale is definitely a bottle-conditioned brew. In fact, bits of yeast seem to have rested at the bottom of my glass. Nearly all the way through my glass of this beer I notice that much of the foam has stuck to sides of the glass in almost crystalline fashion. As I finish this beer I start to contemplate what it would be like to enjoy it off a cask, as I'm almost certain is likely to happen at the Arcadia pub in Battle Creek. I may finally have to visit this brewery to find out for myself how good Arcadia ales can taste. Back in June 2007 I brewed what I had intended to be a brown ale with some Montmorency tart cherry juice from Miller's Northwood Market on M-22 in Bear Lake, Michigan. I've used their cherry juice before for making cherry stout, but this past year I thought I'd try something different, a brown ale. Well, the beer turned out lighter than I had intended and not quite as cherry-flavored as I hoped, but that was at least a couple months ago. Fast forward to early March 2008 and I'm tasting a beer that is quite lively (plenty of carbonation) when poured, creating a thick and rocky head. As the head falls, little bits of sticky lace are left behind down the sides of the glass. Underneath the head, is amber liquid spiked with pink. The tart cherry nose is subtle, but it's there. This beer tastes like a saison - crisp and light - but with the hoppiness replaced by a delicate tart cherry flavor. This beer is not a brown ale (not even close) and not really that big of a fruit beer, but it is enjoyable. Sometimes in homebrewing there's these happy accidents and this beer is one. Although, I think it turned out good, I think a couple different things could make it more interesting; such as adding another gallon of tart cherry juice (I used one gallon in the original recipe) and perhaps adding some honey to counter the tartness of the cherries. I'm not sure what happened to the color; I really thought I added enough chocolate malt, but I obviously didn't and unfortunately I don't know how much chocolate malt I used because I lost the Promash recipe file in a hard drive crash. Fortunately, I do have some notes on the hop schedule. I used low alpha (something like 3.5 percent AA) Hallertau hops, which hopefully will be available despite the hop shortage. Heck, hopefully the cherry crop will good this year, too! ...and I had the taste for a robust Biere de Garde. I picked up a 750-ml corked bottle of Ch'ti Brune a couple weeks ago and trying it out tonight. According to the brewery's website, this beer is made with roasted malts, but I don't taste any of the bitterness that can come from roasted grains. It is also aged for six weeks after primary fermentation at a near freezing temperature in stainless steel tanks. It's a fairly sweet beer, almost bock-like up front, but dry and a bit tart in the finish. Although I didn't get much of a pop from the cork, the beer poured a deep chestnut brown with plenty of carbonation. Once the foam settled (leaving behind some bits of lacing) I poked my nose in my tulip glass and discovered a pleasant musty "French basement" aroma combined with a touch of sourness. This beer tasted of dark dried fruits (prunes, raisins) with some oaky notes and then some caramel sweetness followed by the tart and rather dry finish. I've always enjoyed the Biere de Garde style of beer this time of year and this somewhat tawny example suits the cool, damp weather rather well. The Ch'ti range of beers are made at a brewery in the village of Artois in Northern France, producing a moderately large amount of beer - 40,000 hectoliters - or about 34,000 U.S. barrels. The Ch'ti range includes a blonde, white, amber and triple. The blond appears to be the flagship beer which, according to the brewery's website, has been brewed since 1979 and is even available in mini-kegs! Pictured are Annick and Yves Castelain of the Brasserie Castelain which makes the Ch'ti range of beers. If the Ch'ti Brune is any example of the rest of the Ch'ti beers, I would definitely include a stop at the Castelain brewery or at least one of the Ch'ti Taverns if I ever make the trek to France.